Robert Molesworth & his "Account of Denmark" | The origins, context and impact of an early Enlightenment bestseller. In researching the origins and impact of An Account of Denmark as it was in the year 1692, I discovered that there was much more to it and its author, Robert Molesworth (1656-1725), than the rather biased myths that have been spread about them would suggest. – whose father and uncles fought for the Royalists? – whose original mission was to threaten the Danes with war if they would not make peace at Altona? – who wrote a bestseller that appeared in 4 English, 5 French, 2 Dutch & 2 German editions between 1693 & 1700 alone? 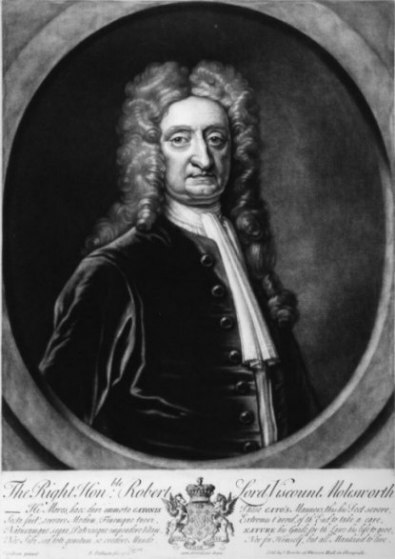 – who John Locke described as “so ingenious and extraordinary a man”? – who was a close friend of the politician, philosopher and writer Anthony Ashley Cooper, 3rd Earl of Shaftesbury? – who was inspired by Sir William Petty and who in turn inspired Adam Smith’s teacher, (the one who Smith called “the never to be forgotten Hutcheson”)? – who was praised by Swift? – whose writings were in the libraries of, and who inspired, several of the American Founding Fathers? – who J C Beckett, a more recent Irish historian, in a study of the period has described as “one of the two leading figures in the intellectual life of Dublin of the time”? The Danish tradition about Molesworth was begun by a contemporary Danish courtier (La Fouleresse) who added to the material produced by three writers in England. Taken collectively the authors Dr William King, Jodacus Crull and Thomas Rogers can best be characterised as high-church Tories who were opposed to Molesworth’s Whiggism and ‘modern’ learning and hoped to be rewarded by the Danish authorities. In 1879 a Danish clergyman, Chr. Brasch, published his study Om Robert Molesworth’s Skrift “An Account of Denmark as it was in the year 1692”. This has been much used by subsequent historians but is very unreliable. More a eulogist than an historian, Brasch was much affected by his focus on the importance of Prince George (in Danish Prins Jørgen), who was Christian V’s brother and was married to the future Queen Anne, the younger daughter of James II. In his rather idiosyncratic study, Brasch for example, tried to explain away comments like Charles II’s about George “I’ve tried him drunk and tried him sober and there’s nothing there” with the explanation that yes, George did drink claret, but he only drank it medicinally. Molesworth did not get the job as envoy to Denmark because of any connection with the court of Princess Anne and Prince George. Having identified the Duke of Holstein Gottorp’s appeal from 1675 – “the strong application to the crown of England, as guarrantee of the Northern Peace . . . written in English” it becomes clear that Molesworth had studied the circumstances surrounding the Danish occupation of the Duke’s territories when he traveled in Germany, while on his annual continental travels in the period 1684-88. There is also evidence that he undertook at least one important secret mission for William before the invasion in 1688. Molesworth was not thrown out of Denmark. After the confederate defeat of the French fleet at La Hogue, King William finally gave him permission to leave to visit his estates in Ireland, and he left as soon as he could. Molesworth’s dispute with Haxthausen before his departure was almost certainly about a wager. Many members of the Danish court, including the French ambassador had put money on the success of a French invasion to return James II to the English throne. They lost, and Molesworth must have left Copenhagen much wealthier, but with a bad taste in the mouths of many courtiers. ‘An Account’ should be interpreted in the context of previous descriptions of Denmark. Contemporary publications in Denmark were indirectly censored, not least by royal decrees about paper rationing, and the content of histories owed more to an unquestioning acceptance of authorities like Saxo, than to actual observations. In contrast Molesworth’s ‘modern’, Baconian upbringing had been greatly influenced by his grandmother whose social circle included some of the leading intellectuals of the day and founder members of the Royal Society (e.g. Milton, Hartlib, Dury, Boyle, Lady Ranelagh & Petty). His ideals were thus based on observation of facts and his values on utility, education and economic progress. In politics he believed in the ‘Gothic polity’ and the chapter of ‘An Account’ which describes this was the most criticised in the answers that were written to it. 1722 Prospect of Molesworth standing as MP for Westminster. 1723 Some Considerations for the Promoting of Agriculture and Employing the Poor. 1724 Frances Hutcheson finishes An Inquiry into the Original of our Ideas of Beauty and Virtue, which includes an acknowledgement to Molesworth. 1724-12-03 Swift dedicates The 5th Drapier’s Letter to Molesworth.